What is Amazon Prime Anyways? I use it weekly, if not a couple times per week. And yes, the FREE two-day shipping even includes us in the middle of everywhere America. Make sure to get your Amazon Prime membership HERE. 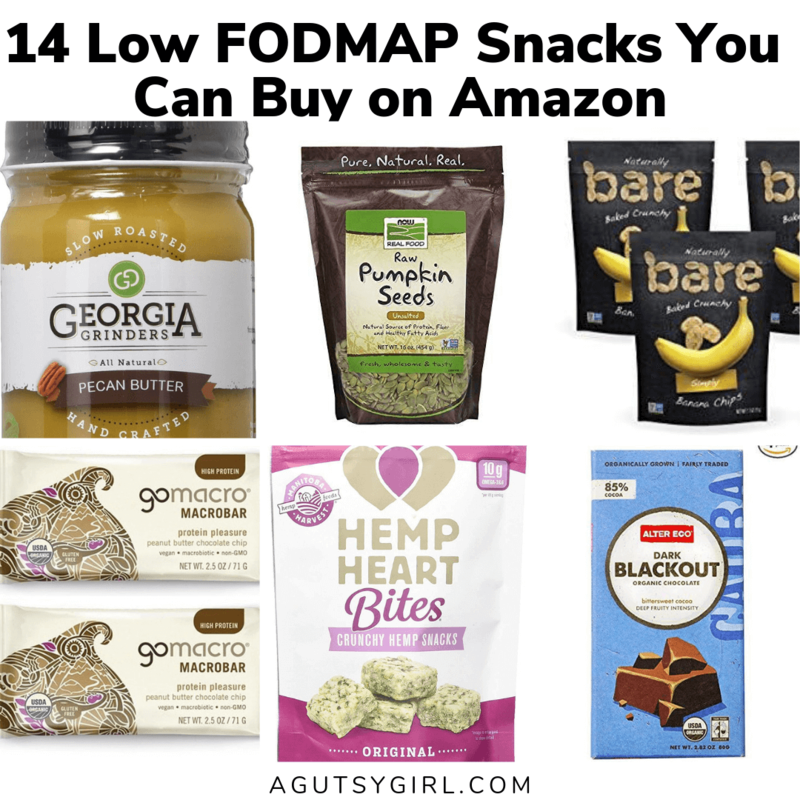 In case you’re new to the Low FODMAP party, click HERE to learn about FODMAPs. Chances are you are not new to it, though; instead, you have been wishing I’d just put together some snacks for Y’all. I’m all about that snack life, too. 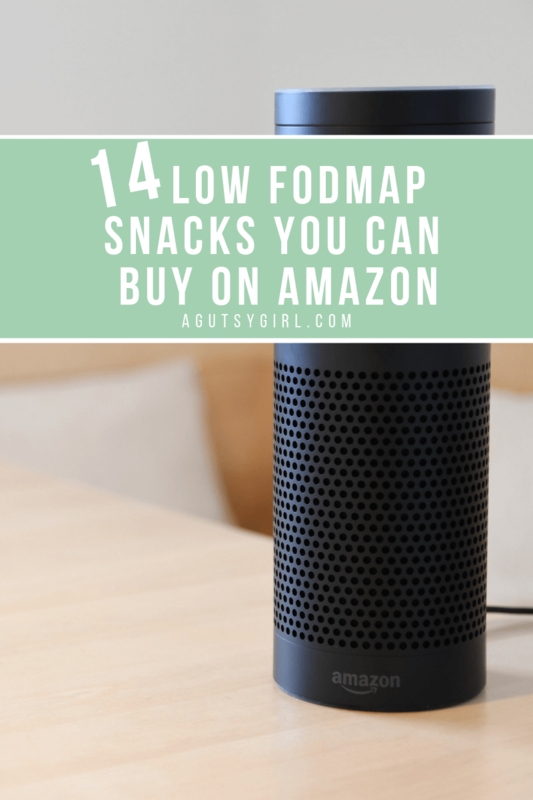 So let’s dig in with these 14 Low FODMAP snacks you can buy on Amazon to get started today. Bare Dried Banana Chips. Up to 15 chips are Low FODMAP. These can be eaten plain or dunk them in number 4 or 7. Fody Food Co, Woodpecker Trail Mix. I love that Fody focuses on the Low FODMAP’ers. I don’t love all of their products, but this one is good. Georgia Grinders Pecan Nut Butter. Best thing since sliced bread. Also pairs wonderfully with gluten-free sliced bread. I prefer this by the (multiple) spoonful. GoMacro Macrobar Peanut Butter Chocolate Chip. I’ve always been a GoMacro fan, and am excited that they have something on Amazon for all of you to enjoy. Jacksons Honest Organic Yellow Corn Tortilla Chips. Ryan got me hooked on chips and salsa. I’m not mad about it. Justin’s Classic Peanut Butter Squeeze Packs. Nothing like classic peanut butter. Squeeze this over number 8. Lundberg Family Farms Organic Thin Stackers Grain Cakes. Rice is a Low FODMAP’ers dream. Made in Nature, Toasted Coconut Chips, Italian Espresso. I’m obsessed with these. Up to 1/2 cup dried coconut is Low FODMAP. Manitoba Harvest Hemp Heart Bites. Hemp rocks for the gut in general, and these totally hit the spot. NOW Foods Raw Pumpkin Seeds. Bonus: use these for Seed Cycling. Quinn Just Sea Salt & Organic Popcorn. I love and trust Quinn; also, their pretzels are incredible. SeaSnax Roasted Seaweed Grab and Go Packs. I have talked about these time-and-time again. They are truly legit, and even my three children (all 5 and under) dig them. Taza Organic Chocolate | Mexicano Disc | Super Dark | 85% Dark Chocolate. Two places for chocolate? Obviously. Hey, Alexa, can you please order me an Alter Eco Organic Dark Blackout 85% Chocolate Bar? Thanks! p.s. I’m always hunting for more.